A coffee thermos is often the best way for you to keep your fresh brewed coffee hot and tasty until you’re ready to drink it. It allows you to take your coffee to work or anywhere else you need to take it for a quick caffeine boost. And that’s probably why the thermos has been in use since it was first invented around the turn of the 20th century. The vacuum flask, as it’s otherwise known, accompanies millions upon millions of people every single day as they head off to work, school or to run their daily errands. 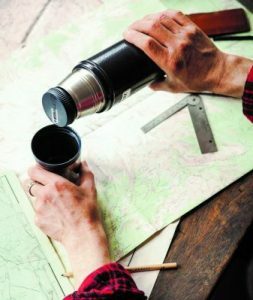 There’s a model for just about anyone, as you will clearly see after we introduce you to the top ten best thermos models for coffee currently available. Available in three different sizes: 12, 16 and 20-ounce sizes, there is a vacuum mug that’s perfect for just about anyone. This thermos comes in three stylish and exciting colors—crimson, green and navy blue—and is fully leak-proof. 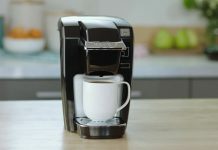 It’s capable of keeping coffee and other beverages hot for up to 7-hours and can keep iced coffees cold for up to 30-hours. This thermos is durable and can easily be opened with just one hand. That makes it a great thermos for taking out on the trail, for taking on a hunting or fishing trip or for taking coffee to work in the morning. Using stainless-steel double wall insulation, this thermos is capable of keeping up coffee hot for up to 24-hours. 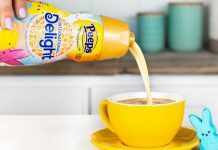 It comes in a large size which may be too big to fit in an automobile’s cup holder but is capable of holding up to 68-ounces, or a full 2-liters, of hot or cold coffee. It durably constructed and always remains cool to the touch when it’s filled with hot coffee. And when it’s filled with cold coffee, it’s designed to never sweat. This thermos is available in a variety of different colors including matte black, stainless steel and midnight blue. And since it has a twist-and-pour stopper, the user can pour coffee without having to fully remove the stopper. This mug/thermos is designed with an auto-seal lid that is leak and spill proof and is designed to keep its contents hot for up to 5-hours or cold for up to 12-hours. It’s available in a variety of different sizes include 16, 20, and 24-ounce sizes. It also comes in a number of different colors from black to stormy weather to violet. And they are also designed to be held with just one hand and to fit in most car’s cup holders. While it may not keep coffee as hot as other comparable models, it does come in convenient sizes that are easy to use and transport. This double-walled thermos uses vacuum insulation to ensure that coffee is kept hot for up to 12-hours at a time. If the user prefers cold drinks, however, it can also keep iced coffees cold for up to 24-hours. It’s made with an 18/8 stainless steel-exterior that helps make it durable and make it suitable for daily use. It has an easy-to-use twist and pours stopper that makes serving coffee quick and simple. 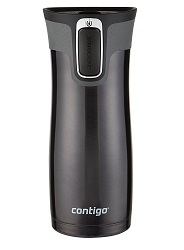 This thermos also has a built-in stainless steel cup for drinking coffee out of, and this thermos is small enough to be transported just about anywhere. All of which makes it a good thermos for bringing coffee to work. Regardless of whether the coffee drinker wants to keep their hot coffee hot or their cold coffee cold, this stainless steel thermos is capable of getting the job done. Using an innovative double wall vacuum insulation, this thermos can keep coffee hot for up to 8-hours and can keep cold coffee cold for up to 24-hours. It has an easy-to-use screw top, is easy-to-carry and is made from durable high-quality materials. This thermos is not only leak proof but is also sweat and spill proof as well. And thanks to its unique design, it’s capable of slipping into a car’s cup holder quite easily. Although this thermos only has a 16-ounce capacity, it still has a number of other features going for it that makes it good for holding hot or cold coffee drinks. It’s made using 18/8 stainless steel that’s BPA-free, and it has a double wall construction that allows it to keep hot drinks hot and cold drinks cold. It has a wide mouth for easy pouring but has a compact design that doesn’t take up a whole lot of space. It also has a slick finish that’s easy to hold and comes in a number of different colors. Some of the single colors that this thermos is available in include black, champagne gold or emerald green. Manufactured inside and out with stainless steel, this thermos is not only extremely durable and almost unbreakable but is also 100% BPA-free. It has a convenient twist and pour stopper, a built-in stainless steel cup and has a nice compact design. It’s most important design feature, however, is its ability to keep hot drinks hot and cold drinks cold. It can keep hot coffee hot for up to 18-hours and can keep cold coffee drinks cold for up to 24-hours. This makes it a portable thermos that’s easy to take just about anywhere from hiking to biking to days on the job site. Unlike its enormous cousin, the 68-ounce Thermos Stainless King, this 48-ounce model is big enough to hold a day’s worth of coffee but isn’t so huge as to be inconvenient to use. It has an extremely durable design that uses stainless-steel both inside and out and remains cool to the touch even when storing hot coffee. It also comes with an insulated stainless-steel serving cup and comes in a number of vibrant colors. This thermos can also be used to hold cold coffee drinks and do so without the exterior getting sweaty. All things considered, this thermos is ideal for just about any activity. Although this high-quality thermos is designed to hold hot tea and even comes with a tea infuser, it does an extremely good job of also keeping hot coffee hot or cold coffee cold. It’s approximately 9.25-inches by 2.5-inches and holds up to 17-ounces of coffee at a time. It’s also leak proof, sweat proof and is made with double wall stainless steel insulation. This model comes in one of four different colors and can be used by both adults and children alike. And it’s sleek design is fairly compact and easy-to-carry. This allows this thermos to be taken just about anywhere. This Stanley thermos is one of the best thermoses currently available for holding coffee. In fact, it’s one of the best thermoses for holding just about anything that the user wants to keep hot or cold including teas or soups as well. It’s made with stainless-steel and is double insulated so it can keep cold drinks cold for up to 24-hours, hot drinks hot for up to 24-hours and iced drinks cold for up to 120-hours. It’s also leak-proof, sweat proof and has an insulated lid which also serves as an 8-ounce cup. And since this thermos is made from stainless-steel, it’s not only BPA free but also backed by a lifetime warranty. If you’re thinking of buying a thermos to keep your coffee fresh and hot all day long, then you’re on the right track. However, you still have to do your homework to ensure that everything works the way you want it to work and that your coffee is drinkable when you open your thermos. And that means paying attention to everything from coffee thermos selection to how the coffee is brewed. Below are some guidelines that will help you keep your coffee fresher for longer periods of time. The first thing that you need to consider is the thermos. There are many different types of thermoses available, and not all of them are suitable for coffee storage. Since your coffee is going to be in contact with your thermos all day long, thermos selection is extremely important. Thermos Types – It’s important to choose a thermos that’s specifically designed for liquids and not for foods. How can you tell the difference? Well, they should specifically state how they’re supposed to be used, but if they don’t, then be sure to consider the size of the vacuum flask’s neck. Ones designed for food have wider necks than ones designed for coffees and teas. Material Composition – Most high-quality thermos models have either a glass inner flask or a stainless steel one. Both of these types are suitable for storing coffee. However, you should avoid the ones made with plastic inserts that have been painted with a reflective coating. These are not only poorly suited for storing hot liquids but can also degrade over time. Insulation – A thermos with a stainless-steel inner core will use a double wall construction. This is suitable for most instances, but some thermos manufacturers take it a step further and add a copper layer of insulation. Either versions of these models will keep your coffee nice and hot. Once the proper thermos has been selected, it’s time to think about helping that thermos retain heat. This can be done by what is known as “charging” the thermos. This means loading it up with heat before you add coffee to it. This can be done by boiling water and storing the water in the thermos for about 10 minutes. Once the 10 minutes is up, coffee can then be added to the thermos and sealed up. You should wait as long as possible before you have to leave the house before you brew the coffee and fill the thermos. Ideally, you’ll want to have the coffee finish brewing and then immediately pour that into the thermos and then leave the house. This will ensure that the coffee doesn’t have to stay warm and fresh any longer than necessary. Now that we’ve gone over some tips for keeping your coffee hot for longer periods of time, it’s time to talk about freshness. After all, it doesn’t matter how hot the coffee is if it has a bad taste to it. In my experience, cheap coffee doesn’t hold up as well as a well-brewed cup of quality coffee. How do you make great coffee that holds up well all day? Well, the first items that you’ll need are fresh high-quality coffee beans. Once you have the coffee beans, then you can store them in a good airtight container, away from sunlight, until you’re ready to grind them. Yes, I said, grind them. Grinding is the just one of many steps to ensuring you have a good cup of coffee. Invest in a good burr grinder, either an electric or manual one, and grind your beans immediately before you brew them. Not the day before and not an hour before you brew them. Immediately after you grind the beans, you should be ready to brew them. No and’s, if’s or but’s. Since you’re using quality coffee beans and a quality grinder to grind them, then it’s probably a good idea to make sure that you have the best water possible. That means making your coffee with either spring water or running your water through carbon-activated charcoal filters. Avoid making coffee with chlorinated tap water or softened water. Chlorinated tap water or softened water make terrible tasting coffee, trust me. Also, make sure that if your coffee maker uses a filter that you use a high-quality one. Cheap filters are often bleached with dioxides or bleaches to give them that characteristic white color. It’s better to use a high-quality filter. The next thing that you’ll want to do is make sure that you brew enough coffee grounds. Don’t try to skimp on the coffee grounds because if you do, then you’ll end up with a weak coffee and weak coffee doesn’t hold up very well. Water temperature is another thing to consider. 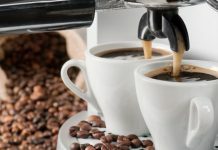 If you’re using a quality coffee machine, then you’re not going to have to worry about water temperature because the machine is going to keep the water within the correct parameters. However, if you’re heating your own water, be sure that it’s around 200-degrees Fahrenheit. If the water is cooler than that, then the coffee will be weak and flavorless. If the water is hotter than that temperature, then the coffee is going to be sour or bitter. Finally, it’s important that you keep all of your equipment clean. This means making sure that the grinder, the coffee maker, and the coffee thermos is all clean. If you don’t keep everything clean, then you are going to end up with terrible tasting coffee. Now that you’ve learned how to select the right coffee thermos for your needs, how to brew coffee correctly and how to store your coffee in your thermos for the day, you’ll never again have to worry if your coffee is going to be substandard. And you’re never going to have to worry about cold, weak or bitter coffee ever again. From here on out, every time you draw a cup from your trusty thermos, you’ll know that you’re going to be tasting the best coffee possible.